Did you know that positive reinforcement training doesn’t just apply to birds? * We can also use it for our rodent friends! If you’ve ever had to give your rodent pet medication, you may have found it difficult. 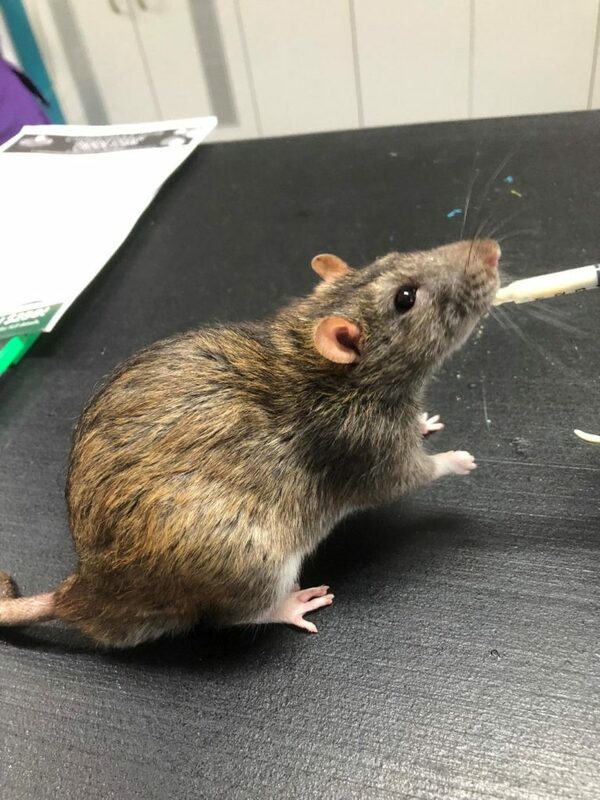 However you can train your rodents to accept treats from syringes (e.g. fruit or vegetable baby food) so that when they do need to take medication from a syringe it isn’t so hard for them! We also recommend weighing your pets regularly, weight loss can be one of the first signs of disease (especially in guinea pigs). The weekly weigh in doesn’t have to be stressful though. You can get small flat scales and bribe your pet onto the scales for a treat (e.g. a favourite vegetable). *NOTE: Positive reinforcement training refers to a style of training where we are encouraging a behaviour (reinforcement) by adding (positive) something to the situation e.g. a treat. It is one of the most successful types of training due to its positive nature. Yum yum yum! This is Gremlin who is LOVING some baby food from a syringe! Rodents are naturally a prey species. What this means is that they don’t like to tell us when they are sick as they display a ‘preservation reflex’, effectively meaning they hide any illness so that they don’t look vulnerable to a predator. This can mean that by the time your pet rodent is sick they are in a bad way! Coming into the vets and getting treatments can sometimes add some stress to our already unwell pets, however treatment is certainly required! There are a number of things you can do at home to reduce the stress of medications and handling (if you ever need to give your pet medicine!). Most of the medications we use for rodents are liquids that are delivered directly into your pet’s mouth with a syringe. For pets that haven’t taken medicine from a syringe before this can be a bit strange! Some medications unfortunately may not be too tasty and it can sometimes be a struggle to get the medication into your pet. That is why it is always a good idea to get your pet prepared to accept things from a syringe BEFORE they require a medication. For rats and mice often fruit and vegetable based baby foods are fairly delicious and often will be readily accepted from a syringe. By training your pet to accept something from a syringe, if the time comes that they require medicine it won’t be so scary for them! You can often also mix the medicine in with some baby food so your pet just thinks they’re getting a treat! We would suggest training this behaviour regularly – so once a week offer your pet something yummy from a syringe. Guinea pigs usually stop eating when they are sick, and this often means they need to be syringe fed a nutritional product called Oxbow Critical Care which comes in aniseed and apple and banana flavour. Often the first time a guinea pig encounters this type of food is when they are sick. Some seem to really like the flavours and others can be a bit fussier. It is a good idea to offer your guinea pig some of this in a syringe every now and again so that they get used to the flavour, so that it is familiar when they are sick it. You can also do the same thing with small medication syringes and baby food (as for rats and mice) so that if your piggy ever needs medicine it is at least used to the syringes. Monitoring the weight of your pet rodent is another very important aspect of veterinary care! Given the ‘preservation reflex’ your rodent won’t tell us they are sick until they are quite unwell, and often by this point they’ve lost a fair amount of weight. By regularly weighing your pet we can hopefully pick up on weight changes quickly, and get on top of any health issues sooner. We would suggest weighing them at least once weekly. Weighing your pet can be achieved by placing them in a small box on the scales, or you can get flat scales and get them to walk onto the scales for a bribe (e.g. baby food, a favourite vegetable). If you have any other questions about training your rodents feel free to book a veterinary consult today! 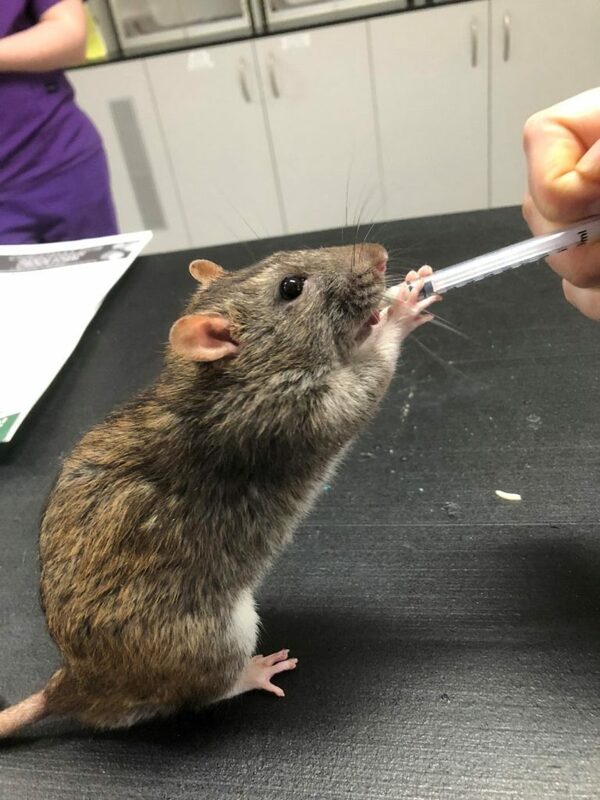 Gremlin loved it so much he wanted to hold the syringe himself!